Yes, that's a Windows logo, but TeamViewer plays nicely with Macs too. 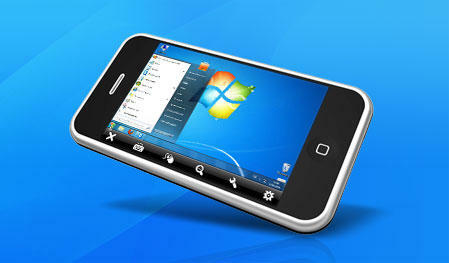 Like LogMeIn Ignition, TeamViewer lets you access a computer over the Internet from your iPhone. The big difference: TeamViewer is completely free. Yup, free. The new iPhone app from German-based TeamViewer complements their (also free) desktop app, which means now you can help grandma find cool Firefox plugins, or show dad how to open iTunes — while out walking your dog. For free. Which is a pretty good deal, especially considering LogMeIn Ignition is $30. Just install the iPhone app, install the desktop client and you’re good to go. “Yeah, but what’s the difference between the free version and the $99 Pro version I noticed at the App Store,” the canny reader might ask. Good question — nothing slips by you, canny reader. Answer: Absolutely nothing. You get the full version for free, with no extra fees attached. TeamViewer does ask that you pay for the app — by buying the Pro version — if you’ll be using it for commercial purposes. I haven’t tried TeamViewer yet, but if the quality of their tech support is anything to go by — which I called to verify a few details and was pleasantly shocked by a prompt and helpful response — the app should, hopefully, deliver.